The corporation has been created and inserted into the Gallente faction of the faction war. 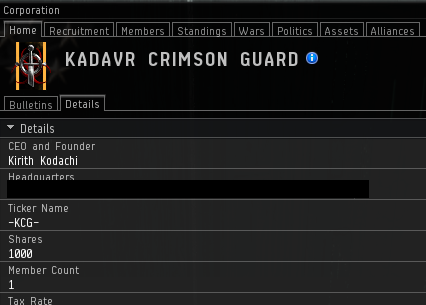 Situation is pretty grim overall right now for the Federation and I have no illusions that my paltry contributions are going to change much in that regard, but I'm going to try and push those fascists back to New Caldari if its the last thing I do. More details on recruitment policies and such will come in the future (once I train Corporation Management and Ethnic Relations up a few levels... never needed to start a corp before). Of course you would have joined the war on the side of those.. those... loafers! Let me know when you start recruiting. Awesome! Good luck in this, running a corp is both incredibly fun and amazingly frustrating at times, but I hope it works out for you. If you need any help with anything, just let me know. Well I am just now getting back into the game as well and I am going to be doing ship manufacturing so if you need some gear shoot me a message and I will see what I can do! FOR GALLENTE! Did you really black out your headquarters? Come to Villore and fight us in OMS and Heyd. It's been a lot of fun since the expansion. The T1 frigate tweaks will make minor plexes even more funnerer. About how long are you planning on sticking to FW? At least 6 months unless something odd happens.